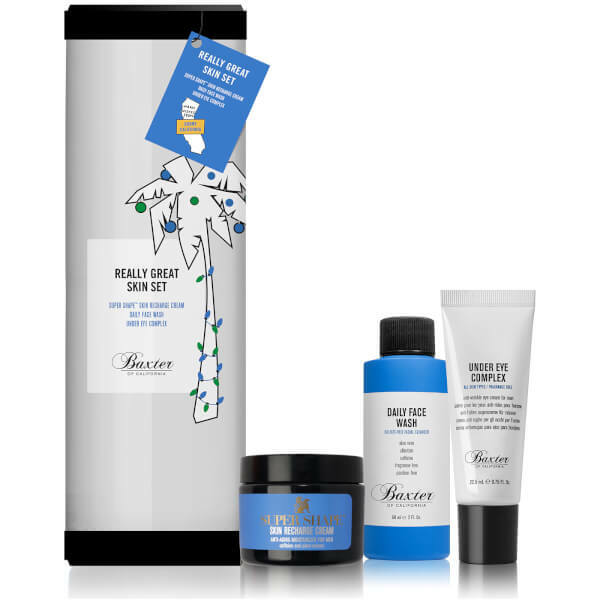 Baxter of California Really Great Skin Set combines three must-have grooming products for high-performance results with minimal effort. Infused with specialized active ingredients, the unique gel-cream formula contains an intense blend of Caffeine and Soy Proteins, which work in synergy to deeply moisturise skin while smoothing the appearance of fine lines and wrinkles. Suitable for all skin types including sensitive, the anti-ageing moisturiser leaves skin feeling hydrated and replenished with a more even and smooth surface. A sulphate-free formula dedicated to revitalising and energising men's skin. Powered by Allantoin, Aloe Vera and Coconut-derived cleansing agents, the invigorating face wash effectively eliminates dirt and oil, without stripping moisture or uncomfortable tightness. Softens and cleans facial hair, whilst leaving skin feeling fresh and smooth. Suitable for all skin types. Suitable for all skin types and fragrance free, the ultra-hydrating eye lotion is designed specifically for men. Marine-based elements help address signs of premature ageing, whilst skin-nourishing Bisabolol, Rosehip Seed Oil and Aloe Vera Gel combat puffiness to leave the eye area feeling soothed and revitalised. Recharge Cream: After washing, apply liberally to face and neck area as needed. Use morning and night. Face Wash: Gently massage a small amount on to wet skin to create mild foam. Rinse thoroughly. Use twice a day, morning and night. Also use after working out. Eye Complex: Apply a small amount to the skin around the eye. Recharge Cream: Aqua / Water, Glycerin, Dimethicone, Isononyl Isononanoate, Alcohol Denat., Prunus Armeniaca Kernel Oil / Apricot Kernel Oil, Polysorbate 20, Propanediol, Peg-20 Methyl Glucose Sesquistearate, Ammonium Polyacryloyldimethyl Taurate, Polyacrylamide, Phenoxyethanol, Caprylyl Glycol, Hydroxypropyl Tetrahydropyrantriol, C13-14 Isoparaffin, Propylene Glycol, Caffeine, Vigna Aconitifolia Seed Extract, Disodium Edta, Laureth-7, Bht, Magnesium Gluconate, Xanthan Gum, Sodium Cocoyl Glutamate, Pentylene Glycol, Hydrolyzed Soy Protein, T-Butyl Alcohol, Tocopherol. Face Wash: Aqua / Water, Sodium Cocoyl Glycinate, Coco-Betaine, Glycerin, Acrylates Copolymer, Sodium Chloride, Phenoxyethanol, Sodium Hydroxide, Peg-60 Hydrogenated Castor Oil, Tetrasodium Edta, Hydroxyethylpiperazine Ethane Sulfonic Acid, Capryloyl Salicylic Acid, Allantoin, Caffeine, Aloe Barbadensis Leaf Juice Powder, Citric Acid. Eye Complex: Aqua / Water, Glycerin, Cyclohexasiloxane, Propylene Glycol, Cetyl Alcohol, Stearyl Alcohol, Squalane, Stearic Acid, Palmitic Acid, Peg-100 Stearate, Cera Alba / Beeswax, Glyceryl Stearate, Nylon-12, Aluminum Starch Octenylsuccinate, Peg-20 Stearate, Phenoxyethanol, Butylene Glycol, Methyl Methacrylate Crosspolymer, Caprylyl Glycol, Panthenol, Tocopheryl Acetate, Chlorphenesin, Caffeine, Sodium Hyaluronate, Calcium Pca, Acrylonitrile/Methyl Methacrylate/Vinylidene Chloride Copolymer, Adenosine, Sodium Hydroxide, Hydroxypalmitoyl Sphinganine, Alteromonas Ferment Extract, Corallina Officinalis Extract.